As we were away for a while since November it was great to get out into the fresh air again and start another year on our travels exploring new places and some old as well and meeting new people along the way. 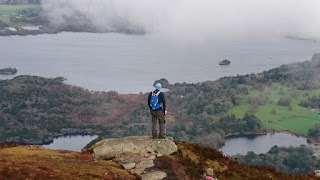 We started this year with a relatively easy day out and we went somewhere we were not before and that was Torc Mountain in Killarney. We arrived with 9 people which was a good number especially as the weather was not great and some could not make it . 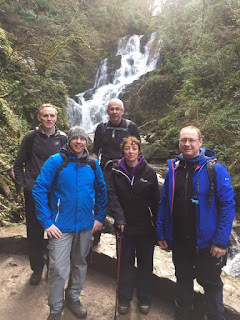 We started at the bottom of Torc waterfall which is always nice to see and up the steps we went which leads us up to the Old Kenmare Road. This road was the old way of going from Killarney to Kenmare which is part of the Killarney National Park and which is also closed to traffic. We made our way along the road for about a quarter of an hour unti we met the sign for Torc Mountain. The one thing great about Torc is for a lot of the way up you are walking on timber sleepers which are covered with a steel mesh to stop you slipping. All the way up you get a great view of the National Park and stretching back towards Kenmare and lloking over towards Mangerton. The sleepers are great at this time of the year as you do not have to be travelling through muddy ground and it also speeds you up. To get to the top at an easy pace you will get there in about 70 minutes from the lower car park by the Waterfall. Torc can also be done from the Car Park by the Old Kenmare Rd. 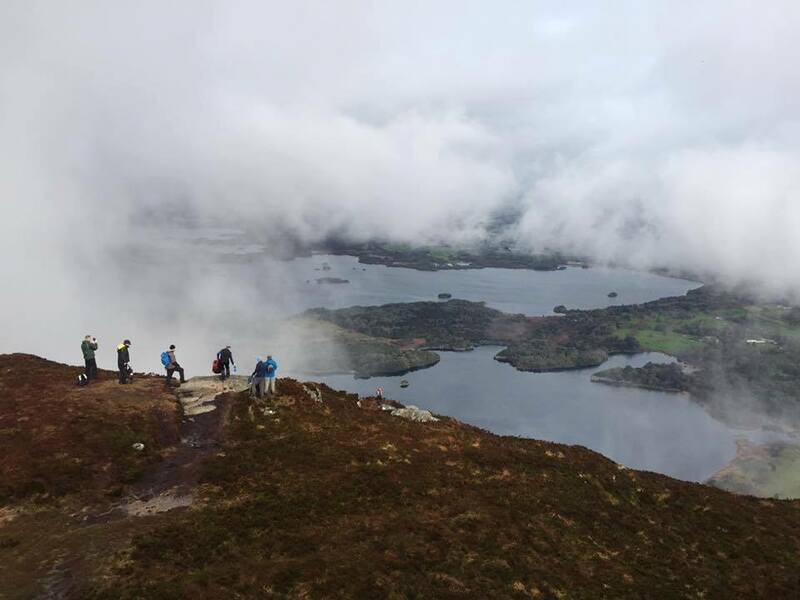 The fabolous thing about Torc is when you get to the top the view is really worth it as you are overlooking the Lakes Of Killarney and today did not dissappoint especially as you could see the lakes through the cloud. This place is really special on a sunny summers day with the sparkle of the water below and Muckross House and grounds just below you. Always worth a trip even on your own and well signposted to guide everyone and easy to follow the sleepers which are great if you have younger people with you. This was a great start to another year and a place we have not been before, yes it was a short trip but Torc is always worth it.